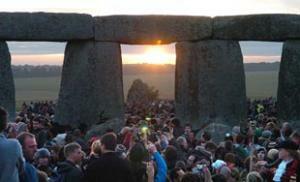 Thousands of Summer Solstice revellers gathered at Stonehenge today to watch dawn break on the longest day of the year. Thousands flocked to Stonehenge this morning to celebrate the solstice, with the sun visible for the first time in recent years. The solstice annually attracts an eclectic mix - Druids, hippies, sun worshippers and those who are curious to experience the ancient festival. Nearly 20,000 people attended the event, with 15 arrests overnight for minor public disorder, a Wiltshire Police spokesman said. As the sun rose at 0452, a cheer went up from those gathered overnight at the stone circle on Salisbury Plain in Wiltshire. The crowds were treated to clear views of the sunrise - previous years have seen the spectacle obscured by mist and cloud. It was announced last week that £10 million of funding for a proposed visitor centre at the prehistoric site has been axed, putting the plans on hold indefinitely. Twenty thousand hippies, druids, pagans and sunworshippers descended on Stonehenge for an all-night summer solstice party that culminated with the break of dawn. At 4.52am this morning, on the longest day of the year, the sun rose to cheers from the tens of thousands who assemble each year at the prehistoric monument on Salisbury Plain. 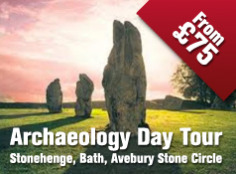 The annual event at Stonehenge, near Salibsury, Wiltshire, is a modern twist on solstice celebrations which were once a highlight of the pre-Christian calendar. Where previous years have seen the dawn obscured by mist and cloud this year's event took place under clear skies. The ancient festival concentrates on the the Heel Stone, a pock-marked pillar just outside the famous circle, which aligns with the rising sun. It means a lot to us ... being British and following our pagan roots,' said reveller Victoria Campbell, who sported a pair of white angel's wings and had a mass of multicolored flowers in her hair. The 29-year-old Londoner, who works in the finance industry, also said that 'getting away from the city' was a major draw to the ceremony. The solstice is one of the few times access is granted inside the stone circle, which has been roped off since 1978, following years of erosion and vandalism. Pratt, who wore a cape of crushed red velvet and wielded an amethyst-tipped wand, said the event gave rise to conflicting emotions. 'It makes you feel small and insignificant ... but it makes you feel like you're here for a reason,' she said. Wiltshire Police were on hand to ensure the event remained peaceful, although 15 arrests were made overnight for minor public disorder offences. Stonehenge's origins remain a mystery, but theories suggest the grounds were part of a huge astronomical calendar. 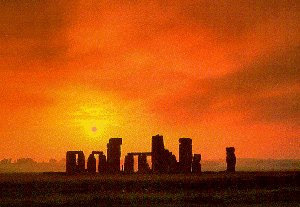 Others say an ancient sun worshipping culture aligned the structure with the midsummer sunrise and the midwinter sunset. The site was used as a cremation cemetery since its inception, archaeologists say, but it is unclear if that was its principal function. 'The truthful answer is we don't know exactly what it was for,' said Amanda Chadburn, an archaeologist with English Heritage, which manages the site. 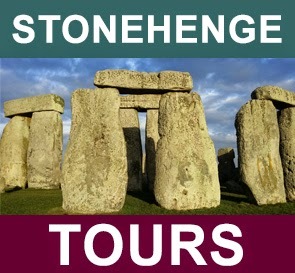 Whatever its origins, the construction of Stonehenge - built with massive stones drawn from up to 150 miles away - gives insight into an ancient culture. The World Heritage site was built in three phases between 3000 B.C. and 1600 B.C. Despite it being one of Britain's most popular tourist attractions, with more than 850,000 visitors a year, it was announced last week that £10 million of funding for a proposed visitor centre at the prehistoric site has been axed, putting the plans on hold indefinitely.